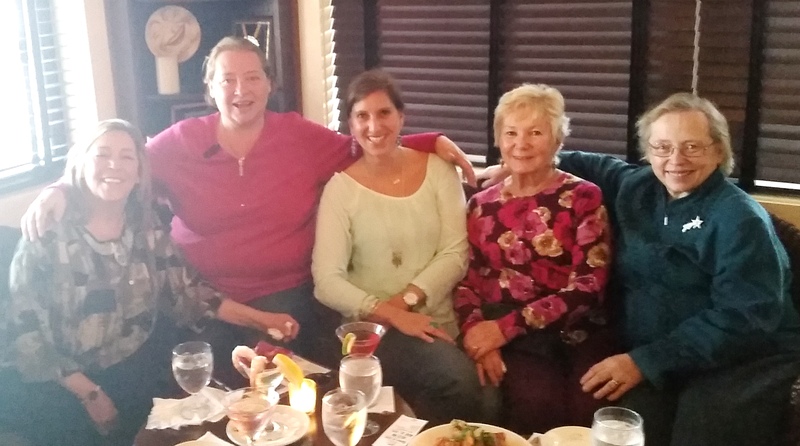 Stop by Moonstruck, on Lake Ave in Asbury Park, on Wednesdays, Thursdays & Fridays from 4-6pm and enjoy a cocktail, some delicious appetizers & great service… all at 1/2 price! This time of year I love the classy, cozy atmosphere of the 1st floor lounge, but I also can’t wait to get outside on one of their beautiful porches once the weather warms up! Moonstruck offers something for everyone and will be packed as soon as the summer season is upon us, so take advantage of this awesome special now – it’s well worth the trip! 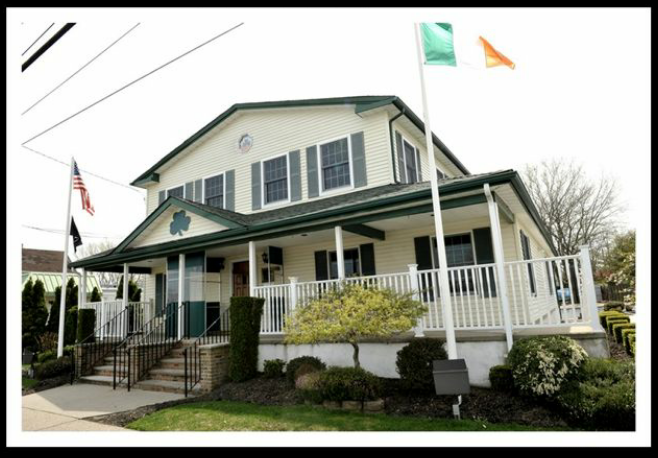 Happy St. Patty’s Day from the Friendly Sons of the Shillelagh! 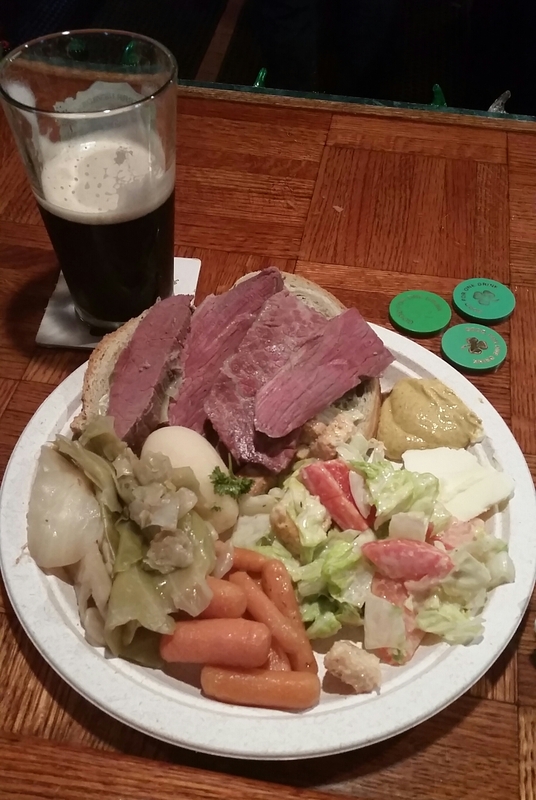 Today’s a big day here… a full spread of corned beef, cabbage, the freshest rye bread and veggies. Top that off with a Guinness from one of the “friendly” Shillelagh bartenders and you’re all set! So if you have even the slightest, bit o’ the Irish in ya… find a sponsor & come on down! Wishing everyone a safe & festive St. Patrick’s Day! 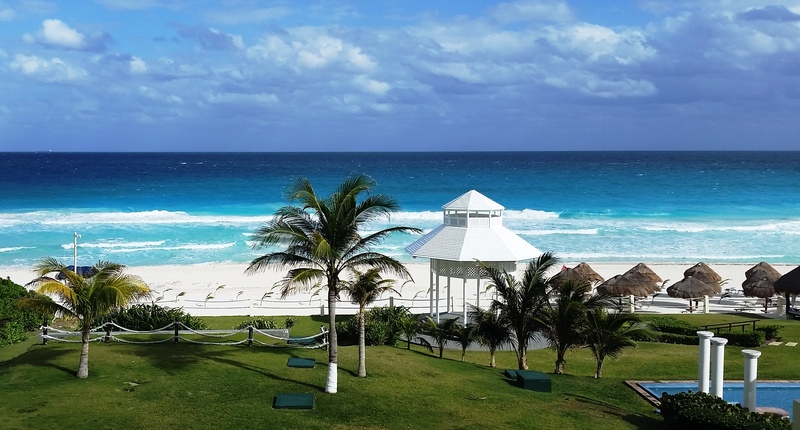 Paradisus Cancun – Review Time! 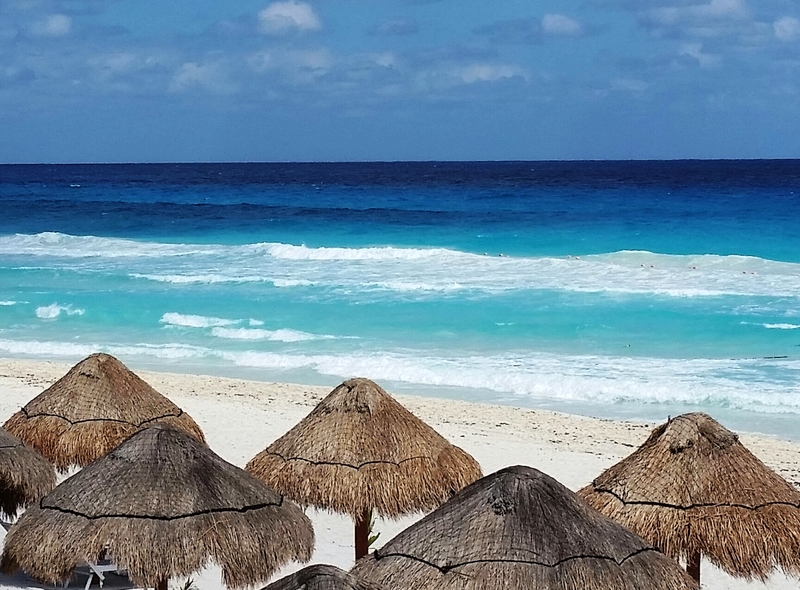 This year’s “5th Annual” Girls Getaway took us to the Paradisus Cancun, where we enjoyed 4 nights of “Royal Service” in the Adults Only section of this all-inclusive resort. Located in the heart of the Hotel Zone, the Paradisus is a quick 15-minute ride from the airport and an easy cab ride to shopping, restaurants & plenty of activities. This narrow strip of land features the Caribbean Sea on one side (for beautiful sunrises) and a lagoon on the other (for picture perfect sunsets). Having stayed at the Melia Caribe Tropical in Punta Cana last year, we were familiar with this Spanish hotel chain and looked forward to a few days of well-deserved, adult pampering. CHECK-IN: Quick & easy, once we were escorted to our beautiful, “Royal Service” lobby. The breathtaking view from our room. THE ROOM: Large, with everything we needed PLUS an amazing view. We booked a “Royal Service Ocean View Junior Suite” and ended up in a spacious, 2nd floor room with 2 double beds, a sitting area with a couch, coffee table & another round table with 2 chairs. There was a flat screen TV (that we never turned on) & a fancy coffee maker which actually turned out to be an espresso maker that we couldn’t figure out. The closet was good size but there were only 3 dresser drawers which seemed odd. The bathroom was large with plenty of counter space, a separate “toilet room” & a big tub/shower. They also supplied a full array of toiletries. The real highlight, however, was the huge balcony. An unbelievable view of palm trees and aqua-blue water provided the perfect backdrop for coffee, reading or wine. The Royal Service section has its own pool area, complete with Bali Beds (which are included, but require a reservation), an outdoor restaurant for breakfast & lunch and its own bar. The private beach was very clean (minus some daily seaweed) and offered plenty of palapas & chairs. This strip is great for walking and you can go a long way in either direction (which we talked a lot about doing, but never did). The ocean, despite being at “red flag” status for our entire stay, was clear and inviting. Definitely not the normal calm waters of the Caribbean, but fun waves to jump around in as long as you were paying attention. Waiters serve drinks both on the beach & by the pool for true “royal” service. There are several other pools within the resort complex, but I can’t comment as we only stayed in our special section. The only place we did venture out to was the beach bar, Coco’s, where we found a warm, sunny, wind-shielded spot on the deck to enjoy our cocktails and the beautiful view. RESTAURANTS: Overall, good & very fresh. Really impressed by the main buffet! There are technically 11 restaurants here, but with only 4 nights, we chose what we thought would be our favorites. Breakfasts & lunch are served mainly at the buffet (definitely get a table outside), and offer plenty of variety… absolutely no complaints here. Made-to-order omelets, fresh juices, meats, breads & Mexican entrees are just some of the items available in the morning. For lunch, we feasted on fresh seafood, pastas, vegetables and much more. The “Market Grill” which is at one end of the open-air section is available for lunch & dinner and offers pizza, salad & grilled meats off an a la carte menu. For a sit-down dinner, you need reservations. In Royal Service, they can be made up to 2 days in advance at the reception desk or thru your Butler. We ended up at the buffet on our 1st night and were pleasantly surprised by the quality and variety of the offerings. The next night, we tried “Vento,” the Mediterranean & Tapas restaurant, which was good, but not quite as good as I had hoped – the selections were just average, nothing too exciting. We went to the Latin-themed, “Fuego,” which was also good, but we experienced very slow service. Our favorite was “Mole,” the traditional Mexican restaurant, complete with a live, wandering Mariachi Band. “Bana” is the sushi spot and was highly recommended but we ran out of nights. There is certainly something for everyone and for the most part, the quality, presentation & selection were above average for an all-inclusive. No central, spacious lobby bar, where everyone congregates (and where we normally like to hang out before dinner). And nothing right on the beach, like a casual “snack shack” where you can just hang out & grab a beer. There is “The Avenue” which faces the water from inside but was weirdly spread out and usually quite crowded, with very little seating. There is a small bar outside called Coco’s (mentioned above) which was nice during the day, but too cold at night to enjoy (at least during our stay). The bartenders at all venues were friendly, but only seemed to offer up the standard drinks (Pina Coladas, Cosmos, etc) and there were no “drink menus”. I had seen some unique cocktails posted on the hotel’s Instagram page & was disappointed when the bartenders had no idea what I was talking about. The Royal Service lobby had its own fully stocked bar every evening, where you could make your own drinks or be assisted by a staff member, with all top shelf liquor. 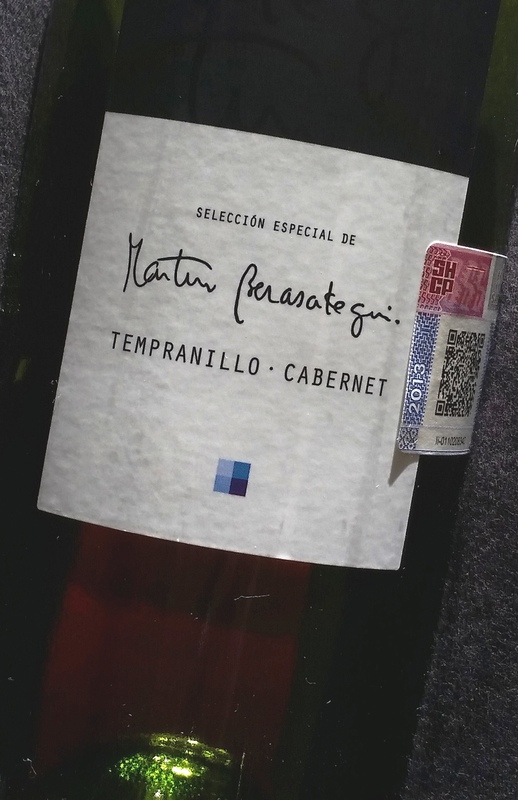 This is also where I discovered my favorite red wine, a delicious, Tempranillo – Cabernet blend! We usually seek out a little nighttime activity, but didn’t really find it here. They had an evening show outside The Avenue Bar each night (right on the floor, not in a theater setting and again with little to no seating) and there is a bar called the “Red Zone” that apparently had a DJ but it must not have started until well past 11pm. There was an amazing “trio” one night in the Royal Service lobby, singing the likes of Josh Groban & swooning the ladies with glasses of champagne but that was all we found. Our main goal on this trip was to relax so this wasn’t a biggie, but it’s nice to hit the dance floor on at least one of our nights on this annual trip and it didn’t happen here. SPA/GYM: The Spa was beautiful and the staff were very friendly. We did a “Chocolate Scrub & 50 Minute Massage” that was awesome & very reasonably priced. We also tried the complimentary “Water Experience” which was an interesting compilation of showers, pools & stones. Unfortunately, every body of water in this spa was FREEZING. They called it Room Temperature but we called it torture (even the shower where we rinsed off from our body scrub was bone chilling). Not sure what’s up with that but it was definitely a disappointment. As for the gym, they have a full set up, including a variety of fitness classes. I only made it once, apparently at prime time (9:30am), as all the treadmills were taken & I ended up on the dreaded elliptical for my workout. – The daily spread of food, wine & cocktails in our “Royal Service” lobby. 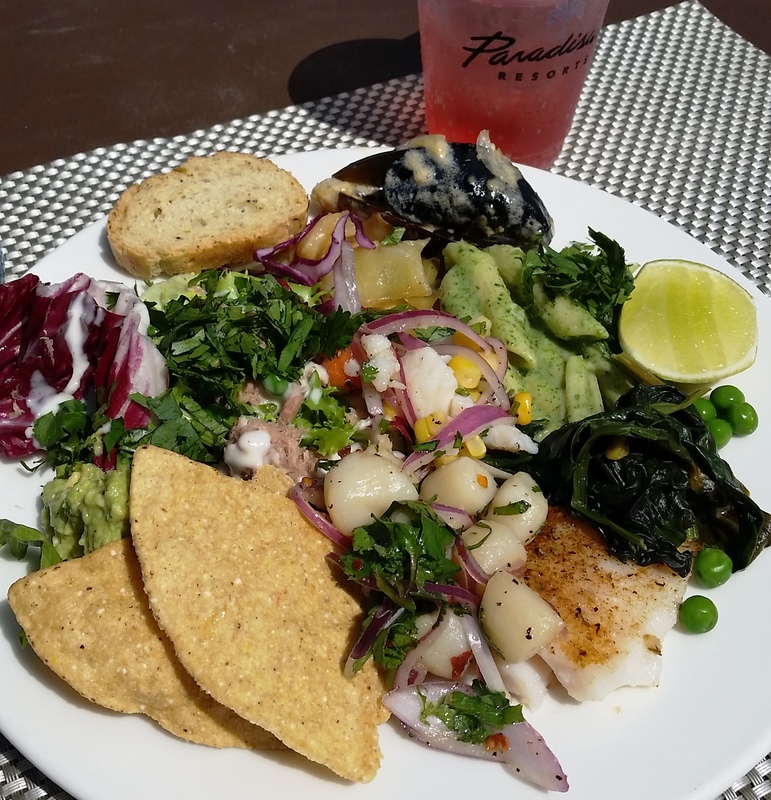 – The fresh guacamole, salsa & chips from the Royal Service restaurant by the pool. – The Internet was available everywhere, even on the beach. – The Ocean… I’ve never seen more shades of blue in one body of water. – Tony. Butler service is where it’s at! – Needed more outdoor access. Within the common areas of the 5 Pyramids, there is very little view of the outdoors. 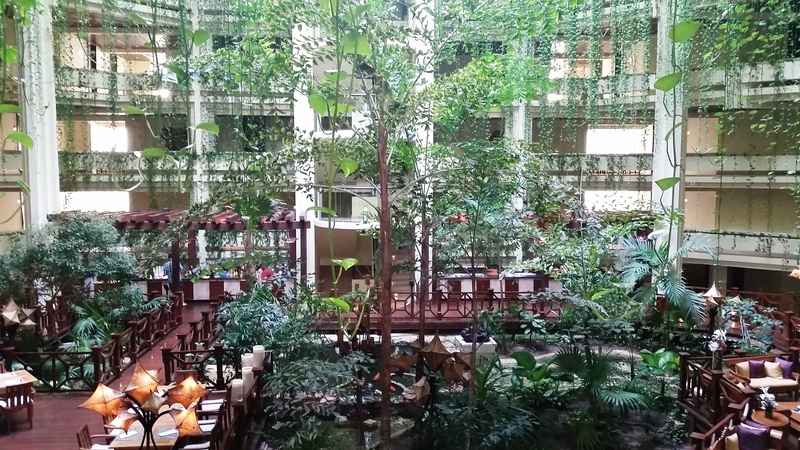 The walkways in between each section offer stunning views through the windows and the insides of the towers themselves are flowing with vegetation, Koi ponds, lanterns, etc, but the feel was that of a big mall or a standard Hyatt anywhere in the US. When I escape to a tropical destination, I need to be able to see & feel it at all times. That’s why I’m there! – Live, local music. Other than the mariachi band in the Mexican restaurant, we really didn’t come across any other local-feeling performances during our stay. When in Mexico, I want to hear Spanish! Our pool area played wonderfully serene, spa-type selections, but maybe in the afternoons they could jazz it up with a bit of local flavor. – A regular coffee maker in the room. Our espresso maker didn’t function properly & honestly in the morning, I just want several big cups of the real deal. All in all, we had very relaxing trip with great service, respectable food & an ideal location. I’d definitely recommend this spot and can’t wait try another resort in this fantastic chain! Prost!!! The Biergarten is Open! I have been waiting for the new “Asbury Festhalle & Biergarten” to open since the fall of 2013, when I first heard about it. They finally welcomed the public on Feb. 7th and we finally made our way there on Saturday night. It was completely packed, as expected, but we made the most of it, using an actual “barrel” to gather around and use as our table. It was loud & crowded, with packed, long picnic tables, just like a typical German beer hall should be. The first order of business was of course, to order a beer. The menu is lengthy, but impressive, with the “Hofbräu Dunkel” immediately catching my eye. I had enjoyed many a “Dunkel” & “Dunken” during my time in Europe so I excited to see this variety on the menu. 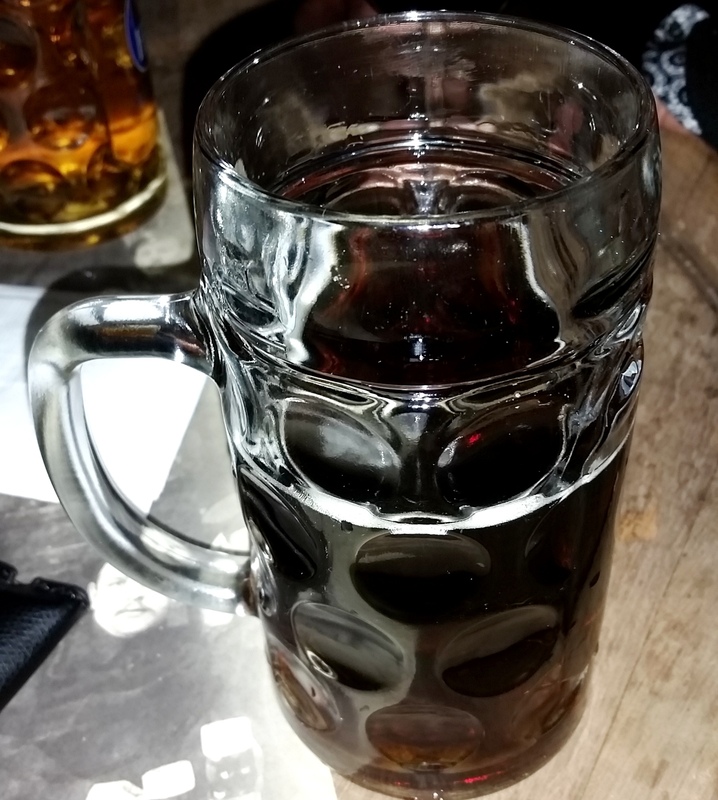 It was as flavorful as I remembered and the giant mug brought me right back to my night at the Hofbräuhaus in Munich. The food menu is equally impressive. We decided to start with a Bavarian “Bretzel” (and a kids frank for my starving son). Both came quickly and were delicious. A few rounds later, alcohol-induced hunger kicked in and we settled on one Bratwurst and one Polish Keilbasa as a perfect first-time sampling. The portions were huge, and each dish was served with sauerkraut, potato salad, mustard, and bread; plenty of food for the 4 of us. What I was most craving, however, was the “Spatzle.” These delectable, egg noodle nuggets are boiled, then pan-fried in butter and topped with a little salt… they’re also a personal favorite of mine from when I lived and worked in Switzerland. I’m happy to report that they were absolutely perfect and will appear on my table every time I come here. Last but not least, we quieted my son with the “Cokolada Cake” – a gigantic piece of chocolate-buttermilk cake, topped with vanilla ice cream, chocolate sauce, and cherries – a work of art (and calories) in its own right. Ryan & his new friends! 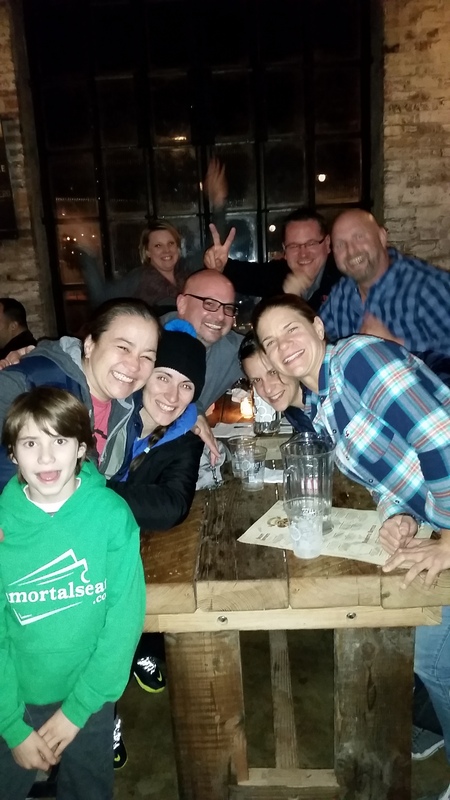 Proximity brings closeness, as they say… and in this atmosphere, it’s almost impossible to not make a few new friends! This happy bunch was seated at the “real table” behind us… the one we secretly coveted all night. No worries… next time we’ll just get there a little earlier or come back on a week night when it’s not quite so crowded. Definitely 2 thumbs up on this one… their hard work, and dedication to keeping things authentic, have clearly paid off. One last thing to note… there’s also a 9,000 square foot ROOFTOP Biergarten here just waiting for the weather to warm up!!! Thanks Dan, Stacey & Dave for the fun night!